HIGH-rise termitaria that stand as rocks in the wilderness are not as silent as they look. Inside they are always teeming with activity of a highly complex and organised society of termites that has created a carefully regulated world of its own, completely shut off from the outside world. Everything is normal till the rainy season, when suddenly a swarm of winged termites of both sexes and royal caste—those capable of procreating— break out of the old, already established termite hills and fly off in search of places where they can form new colonies. Despite having wings these new avatars of underground-living insects are not able to fly beyond 300 to 400 metres from their home mound and cannot climb more than 70 to 80 metres high. They come out in such a large number that despite a majority of them being eaten up by birds and other animals thousands of them survive to continue the next generation. Those who survive eventually shed their wings, form pairs and separate. After separating, these pairs go underground or take shelter in a decaying log, where each couple constructs a nuptial chamber lined with chewed wood mixed with saliva and droppings. Once it is complete, termites seal themselves in and mate. Insects care for their offspring first, but when the nucleus of a new colony is formed, their young ones take over the role and start looking after them. The royal couple continues to breed, with the female growing more and more in size, becoming a huge egg-producing machine that can lay up to 35,000 eggs per day. She remains like this for the rest of her life span, that can extend up to 50 years. The workers carry away eggs to the nearby brood of chambers that are especially constructed for the purpose. 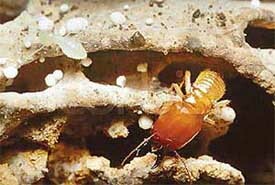 The queen termite does no work except lay eggs, most of which become workers that are not capable of vision due to lack of eyes. They are sterile males and females whose job is to build and repair the termitarium, forage for food and groom and feed the royal pair. The workers duties also include feeding of members of the soldier cadre that guards the nest against foreign invasion despite being blind. Soldier termites have jaws that are too massive for foraging. Soldiers of different species have different jaws. Some have sharp mandibles that can cut off the head of the intruder insect; some flick one mandible against the other to give a powerful blow. There are also species that do not have any weapon, but they use their large heads together to block underground galleries, which can go to a depth of up to 110 feet if necessary, to stop any invasion. The soldiers among tree-living, long-nosed nasute termites use a very effective weapon against their enemies. They do not possess any mandibles. Instead their heads have a hollow snout in front through which they are capable of spraying an acidic substance on the intruders. When this chemical comes in contact with the air, it becomes sticky and traps the invading insect to an almost sure death. These tiny insects evolved and cultivated a system of community living millions of years ago and have perhaps never faced the need to change it since. Besides the queen, workers and soldiers there are also stand-ins that are kept in a state of readiness if the original breeding couple dies. They are then allowed to develop and take their place so that the colony line can continue. The termites, except the queen, however, have a short life span though their colonies continue for a long period. There are examples of colonies that have been in existence for over a century. Termite mounds provide shelter not only to their builders, architects and owners but play host to other animals too. For instance, the Australian lace monitor lizard is one such creature that takes full advantage of these mud structures. The female lizard digs out a hole in it and lays her eggs. Termites immediately undertake a damage-control exercise and soon repair the mound, leaving lizard eggs safely inside. Since the environment inside is totally controlled and fully air-conditioned, creating almost perfect conditions for incubation, the eggs remain inside for nine months. When the proper time comes, the mother lizard’s instinct tells her to dig again to bring out her offspring. Again an Australian creature, the female golden-shouldered parrot digs out a 14 to 16-inch-deep hole in the mound, lays her eggs and incubates. Since she leaves all the termite tunnels open, insects repair it everyday, working throughout the night. They even seal the entrance hole. But the squatter bird is so obstinate that it does not leave the place, instead breaks it open every morning. Very rarely it happens that insects manage to entomb eggs or chicks, but normally it is termites that give up and seal off their own tunnels instead of the entrance hole, ignoring the unwanted guest. The habit of building nesting holes in termite mounds has given golden-shouldered parrot variety of common names, such as ant-bed parrot and anthill parrot. There are many other animals that use termite mounds to shelter themselves and their offspring. They include Australia’s sacred kingfisher, paradise kingfisher also known as white-tailed kingfisher and African bat-eared foxes etc.